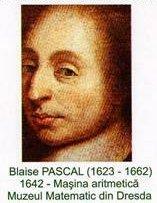 Blaise Pascal was France’s most celebrated mathematician and physicist and religious philosopher. He was a child prodigy who was educated by his father. He worked on conic sections and projective geometry and he laid the foundations for the theory of probability. In 1642, at the age of 18, Pascal invented and build the first digital calculator as a means of helping his father perform tedious tax accounting. Pascal’s father was the tax collector for the township of Rouen. The device was called Pascal’s calculator or the Pascaline or the Arithmetique. Pascal continued to make improvements to his design through the next decade and built fifty Pascaline machines in total. The first Pascaline could only handle 5-digit numbers, but later Pascal developed 6 digit and 8 digit versions of the Pascaline. The calculator had metal wheel dials that were turned to the appropriate numbers using a stylus; the answers appeared in boxes in the top of the calculator. Blaise’s calculated was a polished brass box, about 350mm by 125 mm by 75mm. It was compact enough to carry. On the top was a row of eight movable dials, with numerals from 0 to 9, which is use to add a column of up to eight figures. The right-hand dial represented deniers, the next dial represented sous, and the remainder were for livres, of modern francs. The machines could be used equally well for pence, shilling, and pounds. The machine could add, subtract, multiply, and divide. Multiplication and division were somewhat difficult to do, by performing multiplication and division by repeated addition and subtraction. In fact the machine could really only add, because subtractions were performed using complement techniques, in which the number to be subtracted is first converted into its complement, which is then added to the first number. These two operations were made possible if one considered multiplication as a form of addition and division a form of subtraction. For example, to multiply 1234 by 567 one would register 1234 seven times beginning with the dial on the right. The next dial would be used to register 1234 six times. Finally, the next dial would register 1234 five times. Pull the handle and the answer would appear. Interestingly enough, modern computers employ similar complement techniques. There were problems faced by Pascal in the design of the calculator which were due to the design of the French currency at that time. There were 20 sols in a livre and 12 deniers in a sol. The system remained in France until 1799 but in Britain a system with similar multiples lasted until 1971. Pascal had to solve much harder technical problems to work with this division of the livre into 240 than he would have had if the division had been 100. Pascal attempted to put the machine into production for his own profit. This was not a successful venture, but it did result in a large number of units surviving to the present day. They are all slightly different in that they have different numbers of digits in the accumulator or haveslight differences in the internal mechanisms. None of the surviving models functions very well, and it is doubtful if they functioned perfectly even in Pascal’s day. The mechanism, although ingenious, is rather delicate and prone to giving erroneous results when not treated with the utmost care. Some of them will, for example, generate extra carrys in certaindigits of the accumulator when they are bumped or knocked even slightly. Above is a replica created by Selective Educational Equipment, Inc. of 3 Bridge Street, Newton MA 02195. SEE Calculator is a small replica of the Pascal-type adder made to illustrate the mechanism. Single Register, Pascal Wheel, Mechanical, 1968, USA, 18x4x1 cm. Transparent SEE Calculator where you can actually see how this simple calculating machine works. In 1964, it was sold for US$3.25. i think pascal invented the first mechanical calculator not digital. sat here in my IT lesson at CMS and i absolutely adore this page! 11/10! woohoo! oh my goodness, I have a fetish for mechanical calculators. I am in love with this device. I actually identify as a calculator! Pascal did not invent the calculator when he was 18. I&apos;m not surprised to see that you choose to remain anonymous. I didn´t like the text because it didn´t have a lot of interesting information about the calculator. Hi! I&apos;ve noted your page to identify the calculator that was purchased for me as a child by my father, who&apos;d bought it at a museum, when he&apos;d gone to see the King Tut exhibit (so maybe in Seattle? ), during the 70s. Of course, I&apos;m talking about the "SEE" brand, clear plastic, Pascal Calculator. I DO have the stylus that came with it. I have seen a few online, and now that I&apos;ve found out how very few there are, I&apos;m protecting it. Is there any way to find out its value? It&apos;s in GREAT shape, the stylus is in equally in great shape. Or is there somewhere I can find an appraisal? Or would it be appropriate if it were in a museum? I&apos;m curious as to its importance. I have one of those calculators made by the Selective Educational Equipment Co. It has been in the family for almost 50 years now. Anyone know the value. Thinking of selling it. He really was. For more information, go on youtube and look at Mechanical Computers channel. It&apos;s really good.